Initiation – the whole temple experience is a type of initiation, or preparation, for another stage in life. It prepares us for passage into a new realm, a new state of being, a new place of living. As earthly temples prepare us for the hereafter, so did the heavenly temple probably prepare us in our journey into mortality. Garment – There is an early Christian hymn known as The Pearl which is found in the Acts of Thomas Judas the Apostle, and gives a story in which the person journeying from heaven into mortality must remove their “garment of light” in order to begin their earthly mission. Nibley notes that this garment represents “the preexistent glory of the candidate. 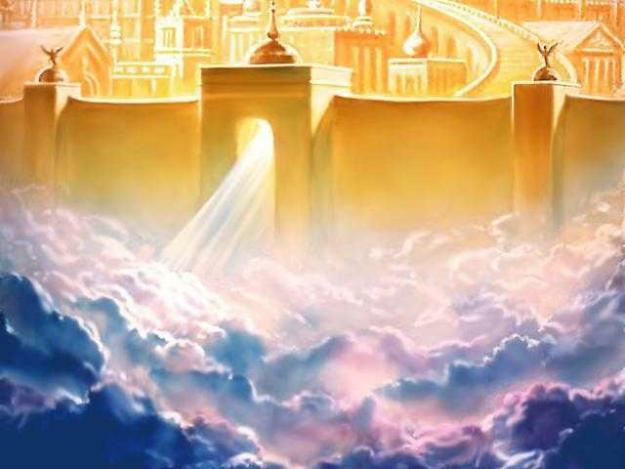 When he leaves his earthly mission, it is laid up for him in heaven to await his return…. In some texts the garment is kept folded beneath the throne of God, awaiting the return of the owner”2. Priestly Robes – In addition to the “garment of light,” The Pearl also says that the candidate must also remove their “purple robe” to venture to this earth, which Nibley interprets as the “outer garment” or “garment of the high priest…. the white undergarment is the proper preexistent glory of the wearer, while the other is the priesthood later added to it”3. Ordinances Foreknown – As we’ve noted elsewhere, Dr. Skinner brings the excellent insight that “the ordinances of exaltation, including their general symbolism and specific tokens centering on the bodily sacrifice of Christ were in place and likely foreknown by us in our premortal existence”4. If we had such a knowledge of the ordinances and its accompanying specifics, we must have participated in some form of the temple ordinances in that sphere in order to learn them. does that mean sin was to be found during that phase of our existence? It certainly seems possible…. Is it possible that the reason one-third of the Father’s children were cast out of his presence for rebellion is that they ultimately and finally refused to accept not just the role of Jesus as our Redeemer but also the means by which their rebellion could have been forgiven, namely the atonement of Jesus Christ, which was operative in our premortal existence? Perhaps.6. So there was some form of cleansing and remission of sin before passing to this earth. First Principles of the Gospel – As mentioned above, in our premortal life there existed the same first principles of the gospel that exist here, namely, faith in the Lord Jesus Christ, and repentance. I would add, the heavenly temple reflects the earthly temple, even from premortality. Did many of us receive the priesthood in premortality? I would say that anyone who has received the priesthood in mortality probably received it first in premortality. So our foreordination to the priesthood was not just a foreknowledge of our receiving of the priesthood in mortality, but an actual receipt of the priesthood in some form while we were still there. New Names – We have modern revelation which teaches us specifically that some people received new names when they came into mortality. We are taught that the premortal Jehovah received the name Jesus Christ in mortality. In the same fashion Michael received the name Adam. Gabriel received the mortal name Noah. It follows, logically, that we have each received a new name when we entered mortality, different than the one we used in our premortal home. As we’ve mentioned elsewhere, names are tied with phases of being, stages of life, and passage to different places. Detailed Foreknowledge of Plan of Salvation – We are taught that our foreknowledge of Christ’s atonement, and God’s plan of salvation, was clear to such an extent that we all jumped for joy in exclamation of our acceptance in how we would be saved in mortality, and the path by which we would be enabled to return to God our Father (Job 38:7). We are also taught that we most likely participated with Christ and other noble and great ones in the preparation and creation of this earth (Abraham 3:24). This we probably did in exercising the priesthood authority we were given then, as mentioned above. We are taught and participate in these same principles of salvation, and taught about the creation, in earthly temples today. So, what happened in the premortal heavenly temple? It appears that the order of things in the temple is the same yesterday, today, and forever. Perhaps this is why as we attend the temple more often, the veil becomes thinner, and the ordinances of the gospel become clearer. Perhaps we begin to recall those teachings we received first in another place and time. ← Is Eternal Life Your Top Priority? and it was the same temple that is in the Celestial kingdom. Or in other words, are you saying the preexistence is the Celestial Kingdom? Thanks for the comment. Your question is an interesting one. The preexistence, better termed premortality, was the celestial kingdom because it was God’s home and we dwelt in his presence there, and it did have a temple. It is our goal to return to the celestial kingdom. But the future celestial kingdom that we will inherit through faithfulness will be somewhat different, if it is not solely by local. We are taught that our celestial kingdom will eventually be right here on earth, once it has been cleansed, purified, and celestialized (Isa. 65:17; Rev. 21:1; D&C 45:58; D&C 63:20–21; D&C 77:1; D&C 84:101; D&C 88:17–18; etc…). This portion of the celestial kingdom did not exist yet, because the earth had not been created yet. It still doesn’t exist, for it will not be established until the earth is glorified and made new. Then God’s glory and kingdom will expand and extend to fill this sphere. Here we will be in the presence of God and have a temple as well. Whether it is the same temple as existed in our premortal state, it is hard to say. I tend to believe that it is the same, unless God establishes different celestial temples for each of his creations. What is certain is that wherever God is, there is his temple. And wherever the temple is, there is God. “And I saw no temple therein: for the Lord God Almighty and the Lamb are the temple of it.”? This seems to imply that the Celestial City has no need of a Temple b/c a Temple represents the presence of God…and in the Celestial Kingdom, we have the presence of God with us. The celestial city itself IS the temple. Most of chapter 21 is describing the heavenly temple. It is the temple that has twelve gates (v. 12), and twelve foundations (v. 14). It is the temple that has a wall of jasper and streets of pure gold like glass (v. 18, 21). John is describing the heavenly temple. Heaven itself, where God dwells, is a temple. There was no temple therein because the visionary was already inside. The celestial temple where Gods literal throne sits was described by Joseph smith and seen by Abraham. the celestial temple in new j that Joseph planed to build is basically a replica. the literal temple of god is celestial. the current endowment that we have is thru terrestrial temples..
the true celestial temple has none of the preparatory steps of initiation and is a place of general assembly with throne and platform in the center. the top of the ark of the covenant is a physical rep of the same as described by Issiah of the court of the seraphim. (same description as by js) six wings or sections on each side the throne or mercy seat in the center. Premortal existence in January 31 1956. I was an angel in heaven and during Flight, I lost my wings falling from heaven. I was briefly in the celestial kingdom in the air its self during flight. And lost my angelic wings. God passes a message at some point in my fall. Now go forth and teach the people of these things that you see and do here. And that you are a part of here. So that they might believe. I believe there was a temple of god in heaven. I have my own art work done from memory in heaven. I broke my right leg during my fall in heaven. And it shows up on moderne Day X-Rays as destroyed bone with broken particles. That is my proof of my life in heaven. I was raised in church of christ, Converted to LDS belief in 1990.